For many punters out there, the best place to try their luck is, of course, the casino. It seems that designers of 6 Appeal slot at Realistic Games shared this opinion since they gave their best to create a game that would offer punters the excitement and thrill of playing in a brick and mortar casino. This 5-reel 3-row video slot with 20 fixed paylines will definitely make you feel like you’re in a real casino, with cocktails, casino chips and a craps table in the background. 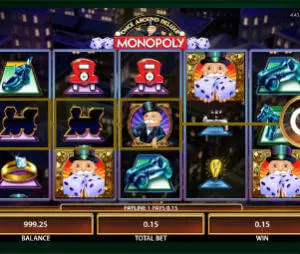 The game is not quite rich in features, although its Free Spins round can bring neat rewards, while multipliers can make those payouts even higher. 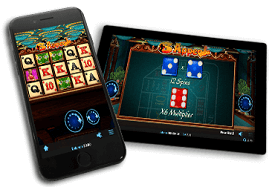 *Notice that there are actually two 6 Appeal slots, the original one and 6 Appeal deluxe slot – both have the same features just slightly different design. The game brings a lot of opportunities to win. Be on a lookout for Wild symbols, which can help you complete more winning combination, thus earning more money. The Free Spins round is definitely the most appealing part of this game. 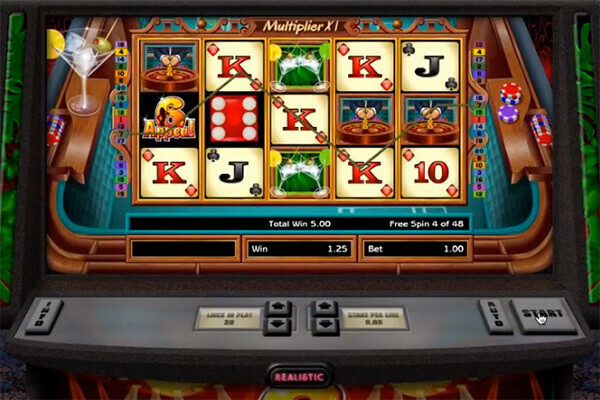 The spins in combination with multipliers can result in staggering payouts. Even better is the fact the feature can be retriggered. RTP of 95.53% and high volatility, which means you won’t get paid often, but your winnings will definitely be worth waiting for. HTML5 slot that can be played on the go. High variance. If you’re an inexperienced player, you could lose your money quickly. Some might think the Free Spins feature is not enough to keep you seated for hours. 95.53% is somewhere average. There are slots with much higher payouts. As we’ve already mentioned, the game’s only bonus feature is the Free Spins round, which not only brings additional excitement, but also the chance to increase your winnings. Triggering the Free Spins feature is easy: simply land the blue dice on reels 1, 3, and 5 simultaneously. However, the number of spins you can win depends on the number of spots on the dice. The three numbers are multiplied, giving you the total number of spin. The feature is reactivated, bringing the theoretical numbers of available spins to 216! Any red dice symbols on reels 2 and 4 on the triggering spin will award players with a multiplier that will be applied to the entire feature! With a multiplier of up to 12x in play, those with enough luck can fill their pockets with cash while the round is active. 6 Appeal slot machine is a nice-looking game that may not appear so interesting or appealing at first. But with its generous Free Spins feature, that offers an abundance of spins, and neat multipliers, this one can easily become your favourite. If you don’t believe us, just give it a go. You won’t regret it, that’s for sure.